An angiogram is, by definition, a picture of a vessel, most commonly a blood vessel. 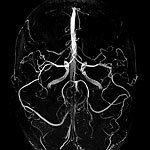 An MRA creates images of the arteries allowing the radiologist to check for abnormalities such as narrowing or vessel wall damage such as aneurysms (ballooning of a portion of a vessel wall that can cause a rupture). The term MRA run-off usually refers to the angiography of the lower extremities or legs. It is not uncommon for doctors to request both an MRI and an MRA of the same body part (like MRI and MRA of the brain) to get a more complete picture and more accurate diagnosis. This is especially true for neurological studies.